Last night I was invited to the London Dungeon for a glimpse of some of London's ghastly past. We were lead back through the horrors of the gallows, paid a visit to Sweeney Todd's barber shop and learned of his wife's culinary skills. Henry VIII's deadliest daughter, Mary threatened to add us to the 300 she had burned for heresy. The working girls lead us through Whitechapel where Jack the Ripper lurked behind every corner. Finally we are lead to Newgate prison where we are hanged. It is my ghost who delivers this to you today where thankfully I only have to contend with swine flu, politicians bird baths and taxes to pay bankers bonuses. Survive the dungeon and they'll discount your visit to the London eye, Madam Tussuad's and the London Aquarium. What fun! Where do I get tickets? Oh, my! What a lovely looking lass! Sounds like a fun place. I want to go! I used to love taking my step-daughter there when she was being particularly horrible! Sorted her a treat! 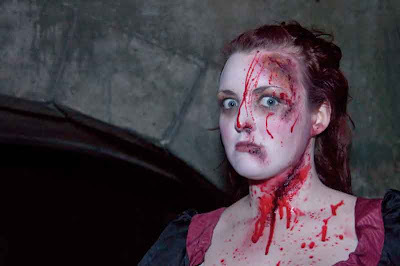 I love the London Dungeon and actually took my goddaughter there a few years back. She was a bit young though and at one point she got quite scared and we left via the staff route. Great shot...it's a wonderfully vivid visual. It must have been and interesting and scary visit !!! Things over here are taking a grim turn - what with your bus yesterday and this today! I've a feeling that if I were the woman in the picture, I'd be looking a little more distressed than she is. She must have had a very robust constitution and nerve!